With more than 200 researchers from 62 countries studying more than 17,000 mid-level managers in the initial phases, the 2004 study is the largest and most prestigious study of its kind in the social sciences. In the latest 2014 study, more than 70 researchers collected data from over 100 CEOs and 5,000 senior executives in corporations in a variety of industries in 24 countries. This study demonstrated the considerable influence of culture on societal leadership expectations and the importance of matching CEO behaviors to expectations for leadership effectiveness. The GLOBE Board is proud to announce that GLOBE has been awarded a 6-year Insight Grant from the Social Science Human Research Council of Canada to conduct the next phase of GLOBE research. We are currently seeking Country Co-Investigators for this next phase. Contact us if you want to learn about the next phase and how you can become a GLOBE Country Co-Investigator. GLOBE researchers were interested in how a society’s culture influences leadership behaviors expected in that culture and whether leadership success depends on a CEO matching his/her leadership style to these societal expectations. To answer this question as well as many others, more than 70 GLOBE researchers collected data from over 1,000 CEOs and over 5,000 senior executives in corporations in a variety of industries in 24 countries. Our findings reinforce the importance of CEOs to organizational outcomes, the considerable influence of culture on societal leadership expectations, and the importance of matching CEO behaviors to the leadership expectations within each society. This massive GLOBE study provides convincing evidence as to which leadership behaviors are likely to be most successful and which should be avoided. The GLOBE 2004 study was the culmination of a ten year quantitative survey-based study of societal culture, organizational culture, and attributes of effective leadership in 62 societies around the world. Ground breaking in scale and scope, the project features results based on data from 17,300 middle managers in 951 organizations in the food processing, financial services, and telecommunications industries as well as archival measures of country economic prosperity and the physical and psychological well-being of the cultures studied.The study redefined scholarly understanding of how culture and leadership vary by national culture. 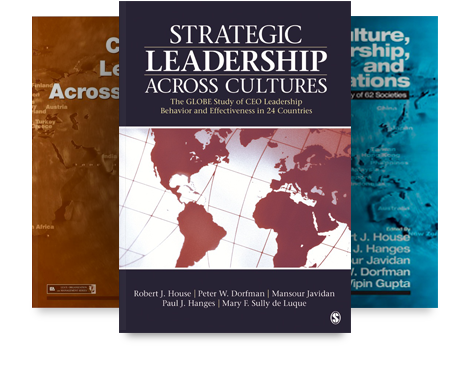 The detailed results of the seminal study are available in Culture, Leadership, and Organizations: The GLOBE Study of 62 Societies. Read more about this study here. The second GLOBE study in 2007 was a follow-up to the 2004 study, with researchers in 25 countries reporting in depth on leadership and culture in their respective country contexts. The findings complement the first study with in-country leadership literary analyses, data from interviews and focus group discussions, and analyses of printed material in order to provide in-depth descriptions of leadership theory and behavior within the 25 cultures. Detailed in the book Culture and Leadership Across the World: The GLOBE Book of In-Depth Studies of 25 Societies, this volume presents a complex collection of global research addressing cultures of particular countries, leadership qualities within those countries, and recommendations on how managers should conduct business in countries other than their own. Data from the study will appeal to scholars in leadership, management, international business, cultural studies; and also to practicing managers.